A long time ago, before motor vehicles were invented, the pathways between buildings were narrow. The people of the time could not conceive of the need for wider roads. A couple individuals needed to be able to pass each other going opposite directions, but not much else. As technology progressed, the city of London grew larger, as did its streets. But the city center was still the same as it ever was, leaving little room for practical living. But the buildings were old, and made as beautiful architecture. Londoners did not want to destroy them, and build anew, so city officials struck a deal. Witches were commissioned to widen the streets with magic, by adding an extra dimension of space in between the space that we perceive. Normal people cannot detect this higher dimension, so we interpret it as nothing but emptiness. Over time, the memory of this act faded from people’s minds. Those who were around when it happened died off, and their descendants did not believe the stories. 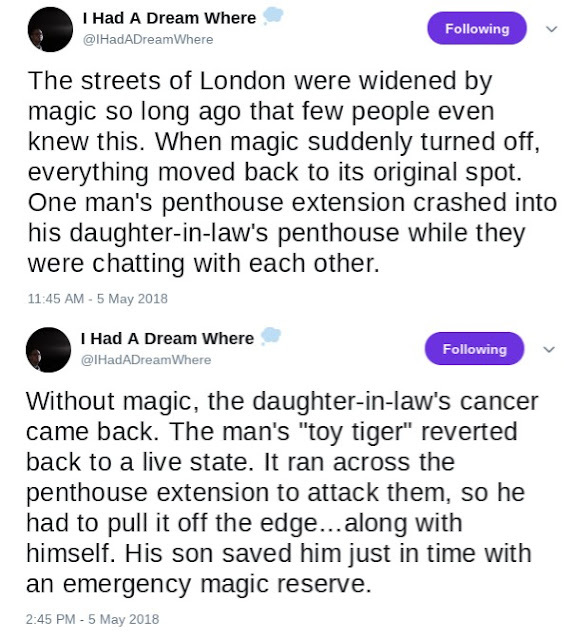 Eventually, even the stories stopped being told, and we were left with a normal city that only a few surviving believers were aware was actually held together by magic. Now in modern day, those original wonderful buildings have been upgraded, dismantled, and replaced, but the magic remains. Even amongst those who know the truth, only one family is aware of what happened to the witches. Some believed them to be immortal, and to still be living up to today. Others thought their descendants now protected the city. Both are right. Both are wrong. The witches have been passing their souls down their own generational lines all this time. Out of each family, three children are born. Two must live on, and live full lives. The other must relinquish their body, and agree to be supplanted by one of their own parents, sometime after adulthood, but before age-related fertility problems threaten the cycle. But of course, this has led to diminishing returns, and the last full-powered witch died yesterday. It has always been my family’s responsibility to care for the remaining powered witches, but there is only so much we can do. With no equal mate, the last witch was incapable of conceiving any children who could bear the burden of her power. She married a nice man, and raised three lovely children, but they could not possess magic. So when she finally passed on, the London spell automatically dissipated, as did all other magical spells. The central buildings were suddenly sent hurtling towards each other. A great many people were killed or hurt in this, but most of the buildings themselves remained intact; if only closer together. Two buildings, however, were not so lucky. I met my wife three dozen stories up in the air, above the street. For whatever reason, the architect responsible for both of our respective buildings decided later to construct extensions from both of the penthouses, so they were only a few meters apart from each other. This allowed us to carry on conversations from opposite buildings. I was attending to the last witch’s body when magic turned off. The penthouse extensions crashed into each other. My father and wife, who were chatting up there, were quite nearly killed. But this was not the only spell affected. The last witch used magic to cure my wife of her cancer, as a sort of profoundly beautiful gift, but her illness returned upon the end of magic. A toy tiger that had been passed down the family, and presently belonged to my son, turned out to be a real tiger. We still don’t know which witch transformed it, when exactly, or why. As my father and his daughter-in-law were trying to make their way off the extensions, the tiger ran across it, and tried to attack them. My father was forced to pull it off the edge, sending both of them falling towards their deaths. But there was one more gift the witches bequested to us before their end. I had with me a secret reserve of magic that I was told would be good for one further spell. I used it to save my father’s life, as well as the tiger’s, landing them both safely on either side of a fence in the nearby zoo. But a second spell cast itself, completely out of my control. It turned my son into a new witch. And it was he who put the buildings back to where they belonged, repaired all the injuries and deaths caused by the temporary loss in magic, and erased everyone’s memories of the whole thing. But we don’t know what to do next.